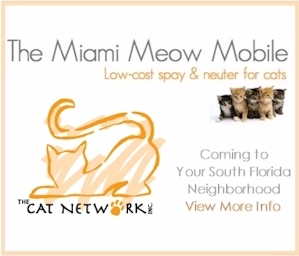 In addition to the low cost spay/neuter services The Cat Network provides, periodically, we are asked if we are familiar with other low cost spay/neuter programs in Florida. We have compiled this list, but please keep in mind that it is not complete. If you are interested in finding a low cost spay/neuter program in your area, we suggest doing a search online. They provide low cost service at both locations. bring card and photo ID. Veterinary Care Clinic also has all of the other vaccines at low prices. It is open on Saturdays, 3:30 – 6:00 pm for vaccinating only. No appointments needed. They provide affordable spay/neuter services for domestic or feral cats. This service of the Humane Society of Broward provides low cost spay/neuter on their van. This is a referral service open to only families of low to moderate income. Eligible households can receive up to 8 vouchers which can be used at area vet offices. This program requires a very low individual payment. Their S.P.O.T. program provides free spay/neuter services. This facility offers low-cost spay/neuter services on their van. It operates under a limited schedule. This is a private veterinary hospital that offers low cost spay/neuter services. They offer a referral service to vet offices in Miami Dade, Broward, and Palm Beach counties. Services are for pets as well as strays. This is a free service offered to everyone in the local Keys community. This is a low cost service available through their mobile trailer. This service is for companion pets. They offer low-cost services through their Spay Shuttle. Free service is offered to those on qualified public assistance programs. Their low cost program requires a deposit. All animals are welcome. They must be able to be handled. They offer an in-house clinic. Their special emphasis is on helping to spay/neuter ferals. They have a low cost clinic. They offer an all-inclusive feral package. Volunteer Services for Animals, Inc. They provide information on low cost spay/neuter programs. This service is for residents of Alachua County and Humane Society members. They sell low cost spay/neuter vouchers that are accepted at area vets in the county. Free Spay & Neuter for Pets In Low Income Households No More Homeless Pets & Maddie’s Fund will provide free spay neuter for Alachua County pets living in low income families. Students included. Provides spay/neuter assistance to those who cannot afford it in Volusia Co. They provide low cost spay/neuter certificates for use by residents of the county for use at local vets. This program is for feral/strays only. They provide low cost or free s-n for feral or abandoned cats in Orange County FL. They provide low cost services to residents of Central Florida. Has mobile clinic for low cost or free s-n. with proof of public assistance. Low cost spay/neuter for pets, priced according to owner’s income. The AniMoble is a mobile spay/neuter clinic that travels to locations in Martin County. 1008 N.E. Jensen Beach Blvd. They offer low-cost vouchers which are available for purchase at their facility. These vouchers can be used for payment at area vet offices. These are for use of residents in Martin and St. Lucie counties. Animal Birth Control of Martin County, Inc. Assists private individuals who cannot otherwise afford to spay or neuter the dogs and cats within our community by working jointly with several veterinary hospitals. Requires a modest co-pay in order to schedule appointments. They provide low cost spay/neuter for pets and feral cats to everyone. They sponsor low cost spay/neuter days once a month for feral cats. They have a special program for those residing in Hillsborough County through the use of the Hillsbourough County Spay/neuter Voucher Program. Residents can get their pets fixed and get their rabies vaccine and county tag for $10.00. Through the use of their Neuter Scooter, they provide transportation to/from the clinic from Petco locations. Animal Protection League of Hillisborough Co. Inc.
and DeSoto Counties, as well as any one able & willing to make the drive to their clinic. They may be reached at (863) 773-2424 or contact Animal Birth Control (above) for program application. Offers free s/n for pets of people on public assistance. Also offers LOW COST s/n for pets of everyone else. Clinics in St. Augustine,Bunnell & Interlachen – Feral Cats Welcome! This low cost Spay/Neuter program is open to pets of St. John’s County. They offer help to people according to a sliding scale based on their income. They also offer help to free roaming colony caregivers. This is the only non-profit mobile spay/neuter hospital in Northeast Florida. They offer low cost spay/neuter programs for low income families in Sarasota and Manatee counties. They have a sliding scale discount service for spay/neuter for pets in Charlotte County. Free Spay Neuter Program – Income Qualifications Apply! Click on SERVICES, then on ANIMAL SERVICES, then click “Free Spay Neuter Program” from menu on left. Friends of Animals provides discount certificates through their online program. These spay/neuter certificates can be used at participating veterinarians nationwide. They provide a list of low cost spay/neuter services in your local area.